French translator; lived in the first half of the fourteenth century. He translated (after 1328) from the Arabic into Hebrew, under the title "Happalat ha-Happalah," the treatise of Averroes against Ghazali's "Tahafut al-Falasifah." The translation is preceded by an introduction in rimed prose, in which Kalonymus excuses himself for having undertaken to propagate a work written by such a heretic as Averroes, and alleges that the arguments of the latter are sometimes so weak that they serve to strengthen Ghazali's attacks against the philosophers. 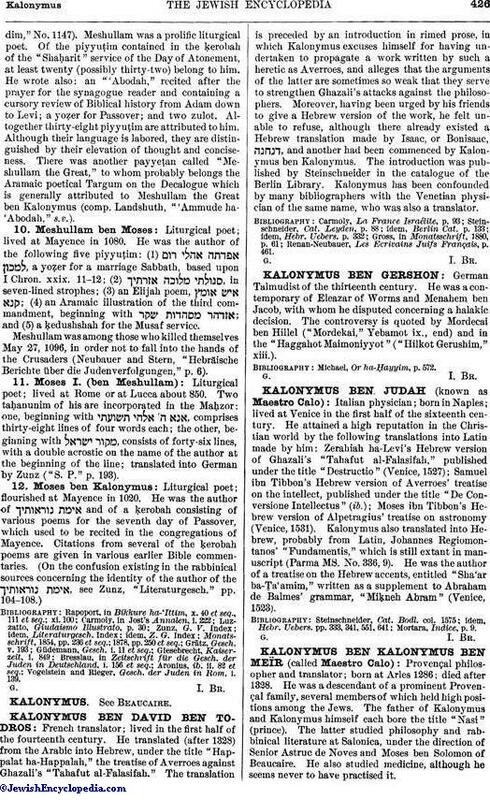 Moreover, having been urged by his friends to give a Hebrew version of the work, he felt unable to refuse, although there already existed a Hebrew translation made by Isaac, or Bonisaac, , and another had been commenced by Kalonymus ben Kalonymus. The introduction was published by Steinschneider in the catalogue of the Berlin Library. Kalonymus has been confounded by many bibliographers with the Venetian physician of the same name, who was also a translator. Renan-Neubauer, Les Ecrivains Juifs Français, p. 461.